Do you want to train your dog to be the best behaved slipper-fetching, running, jumping, wonder dog ever...? Then we’ve got just what you need! The Dog Training Mastery Multimedia Package from the Kingdom of Pets team is everything you’ll ever need to help you look after the health needs of your dog, get him house trained quickly and easily, and make sure he’s behaving exactly the way you want him to all the time. This comprehensive package is chock full of cutting edge advice and direction from our top vets and animal behaviorists. And you can get it all today for one great low price! Unfortunately too many people have a rush of blood to the head and buy a puppy without being fully prepared. Now, I’m not talking about having a blanket and a bowl and some toys, although those things are important. What I’m talking about is having all the skills and strategies in place to deal with all the challenges dog ownership has in store for you. General Health, including diet and exercise. If you can cover these three areas effectively then you’re in for years of pleasure from your new best friend. That’s why the creators of Secrets to Dog Training have put together this amazing package. 1. 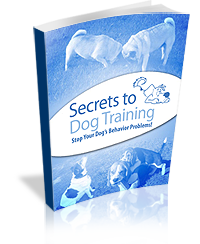 Secrets to Dog Training: Stop you dog’s behavior problems! To turn your dog into the best behaved dog you’ve ever met you need the internet’s #1 selling dog training book, Secrets to Dog Training: Stop Your Dog’s Behavior Problems. If you want your dog to be well behaved around people and other dogs, and have them obey all of your house rules, even when you’re not around, then this is just what you’ve been waiting for. With Secrets to Dog Training, you can finally find all the advice and support you’ve been looking for. And you can finally get the well behaved, rolling-over, playing-dead, slipper-fetching best pal you’ve always wanted. The Secrets to Dog Training eBook contains 256 pages full of everything you ever wanted to know about dog obedience training, but could never find the answer to. Plus, in The Dog Training Mastery Multimedia Package, not only do you get the Secret’s To Dog Training eBook, worth $67: you also get the audio book, worth another $67! That’s a fully downloadable audio version of the eBook so that you can listen to it anywhere you like; wherever you want to give your learning a boost. But that’s not what you’ll pay today! Ok, so your dog’s general behavior is sorted, now what about House Training? Well, your carpet cleaning and odor killing days are numbered. 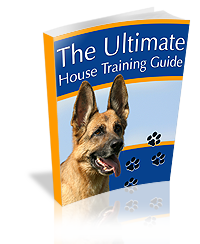 The Ultimate House Training Guide is your ultimate resource for ensuring your house training experience is positive and problem-free, from day one. This essential dog training resource is usually valued at $37 for our regular customers. But I have a much better deal for you today! At one time or another, whether you're a new dog owner or a well weathered one, you've probably had to deal with an ill or injured dog without the knowledge and confidence necessary to provide the right care, right away. From the frustration of not spotting a symptom sooner, to the fear of not knowing how to respond to a pet emergency, you've probably grappled with this most stressful part of dog ownership. Or perhaps you just want to learn more about the best friend you could have on four legs - but you want a source that doesn't read like a canine physiology textbook? 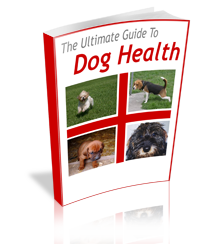 The Ultimate Guide to Dog Health contains everything you’ll ever need to make sure your precious pooch stays fit and well. Comprehensive symptom charts relating to all of the canine body systems, which will empower you to make confident decisions about your dog's health requirements. Each chart moves from specific symptoms to a recommended path of treatment, and advises if, when, and how urgently you should seek veterinary attention. When it comes to dog health care products, these charts are an absolute gem! Fully-illustrated, step-by-step instructions that walk you through the process of safely giving medications to your dog - whether it's for the eyes, ears, or mouth, by pill or by paste, you'll rediscover confidence and cooperation when "medicine time" rolls around. A detailed reference to more infectious canine diseases that you can shake a syringe at - and clear recommendations for a failsafe program of vaccination. Detailed care advice written in plain English, on how to deal with everything from allergies to canine cancer. A full catalog of all of the common parasites that can affect your dog - internally and externally - complete with color diagrams that will help you identify these tiny enemies if they make your dog their home. We usually value this fantastic resource at $49.95, which bring the total value of this amazing package up to $220.95. But that’s a long way from the price I have for you today! Now, it’s one thing to read and hear about how to train your dog; it’s another thing to actually see training in action! That’s why, in The Dog Training Mastery Multimedia Package, we include a whole bunch of great online video tutorials. First of all there are the In Field Training videos. This professional video training resource is valued on our site at $97! Usually when people purchase any one of our dog training or health guides, we offer them the opportunity to upgrade by adding the Premium Online Videos. But today I’m going to include these advanced online videos as an integral part of The Dog Training Mastery Multimedia Package. Put an end to your dog's aggression towards strangers or family members, address fear aggression, and territorial aggression. Ensure that your dog never becomes a threat by following these simple steps. Does your dog play too aggressively? Is he possessive of toys, food, or people? Does he fight with other dogs? These online videos will take the aggression out of the equation. We teach you what different types of bark mean, and show you how to communicate to your dog so that he knows when and where it is appropriate to bark. Our professional dog trainer shows you amazingly simple but hugely effective techniques that will get these behaviors under control. Find out how pack instincts are shaping your dog's actions, and how you can use them to your advantage. Usually valued at $59.95, the Premium Online Videos brings the value of the video component of The Dog Training Mastery Multimedia Package up to $156.95! But you’ll be getting it all for one low low price! 5. Even more dog health and training value! That’s another $174.60 worth of invaluable health care and training information! 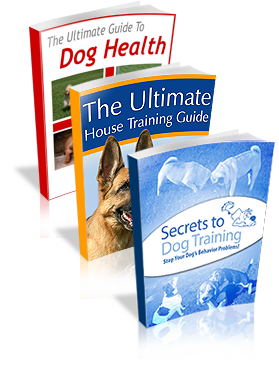 $552.50 worth of Dog Training and Health resources for just $99.95! ...I really wish I'd heard/got the Secrets to Dog Training books years ago, in my opinion no dog owner should be without a copy. They're brilliant, very easy to understand/follow and they results are amazing!" ...We have a crossed breed Poodle/Terrier and training him is extremely important to us since we live in high rise apartment. Sumo, our pup, is doing great! At only 5 months old he sits, lies down, heels, stays, and even comes most of the time. Secrets to Dog Training continues to provide support through email which we feel is a priceless resource." ...Now my puppies eat, sunbake and play together very happily. I would recommend it to anyone who cares about their animals." Thanks guys, that’s some high praise! That’s a total package worth $552.50! Now, I’m about to make this decision even easier for you with the Kingdom of Pets 100% money back Triple Guarantee!. So that’s everything you need for a long life full of fun and contentment for you and your dog all for just $99.95! That’s 82% off the regular price of all these amazing products combined! Yes! I love my dog and want to care for him properly and train him to become the well behaved family member that I'd always dreamed he'd be. I want to order The Dog Training Mastery Multimedia Package INSTANT DOWNLOAD and gain immediate access to the Members Area right now! Stop your Dog’s behavior Problems! Plus the Online Video Learning, AND the 8 Bonus E-Books! Never be responsible for training or caring for your dog the wrong way again. The Dog Training Mastery Multimedia Package, is your key to lifelong fun, peace, health, and happiness for you and your dog. Author of Secrets to Dog Training: Stop Your Dog's Behavior Problems! P.S. Remember, If YOU Want to Improve Your Dog's Behavior in the Shortest Possible Time Then The Dog Training Mastery Multimedia Package, is For YOU! P.P.S. Remember, With Every Order, You'll also get all the Bonuses - Completely FREE! You have nothing to lose ordering The Dog Training Mastery Multimedia Package, no matter what country you're in Start your dog obedience training today!